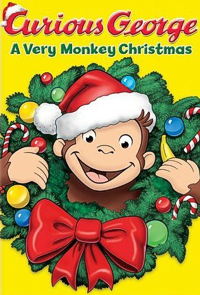 Win a Curious George: A Very Monkey Christmas Prize Pack! Courtesy of Universal Studios Home Entertainment, we have a festive themed Curious George: A Very Monkey Christmas Prize Pack to give away to one lucky reader to mark the occasion of the little monkey’s latest animated adventure on DVD! All you need to do is enter your details in the form below to be in with a chance of winning the Pack, which includes the Very Monkey Christmas DVD, Curious George Christmas Countdown book, a CD soundtrack and a Curious George Live ticket voucher! This contest will close on Sunday, December 6, 2009 at 11:59pm ET. Everyone’s favorite monkey stars in the all-new movie, Curious George: A Very Monkey Christmas, a new holiday classic that the entire family can enjoy year after year. George and the Man with the Yellow Hat are having a great time getting ready for Christmas. There’s only one problem: neither of them can figure out what to give the other for a present. The Man finds George’s wish list indecipherable. And George doesn’t have a clue about what to get for The Man who has everything. Can they resolve their dilemma in time? With three all-new holiday songs and other classic Christmas music, Curious George: A Very Monkey Christmas makes the perfect gift, a must-have for your holiday collection! In conjunction with the DVD release, Universal is also running an “All I Want This Holiday” $100,000 instant win game that will give one lucky grand prize winner $100,000 to create their own “Family Fund” (awarded in the form of a check to the winner) to invest in a college tuition fund, pay for a new home or even take a year off to spend more time with the kids. More than 200 additional prizes will be awarded, including HDTVs, Netbooks, Blu-ray players and more. Enter and see official rules at Universal’s Curious George page. Visit the little monkey’s official website for more Curious George fun! THE SMALL PRINT: Winning names will be drawn at random. Participants must provide a full name, mailing address and valid email contact. This information will be kept confidential and deleted after the contest has closed, although Animated Views withholds the right to publish winning names and location area only. One entry per household. The DVD is a Region 1 edition and the contest is open to US readers only. Prize is non-transferable and no cash alternative will be offered. No responsibility is accepted for inaccurate prize descriptions provided to us at the time we go to press. The administrator’s decision is final and no correspondence will be entered into. Associates of Animated Views and Universal Studios Home Entertainment are unfortunately ineligible to enter. The contest closes on Sunday, December 6, 2009 at 11:59pm ET. This entry was written by kelvin, posted on November 30, 2009 at 5:54 am, filed under Animation. Bookmark the permalink. Follow any comments here with the RSS feed for this post. Trackbacks are closed, but you can post a comment.